Direct Impingement operating system. Eighteen inch match-grade hammer-forged, chrome-lined, free-floating barrel with 1:7 inch twist rate. SureFire ProComp 556 muzzle brake. Match grade Timney trigger with 3.5 pound pull. Hard-anodized aluminum receiver. Flat top upper receiver, M1913 Mil-Std rail at 12 o-clock. 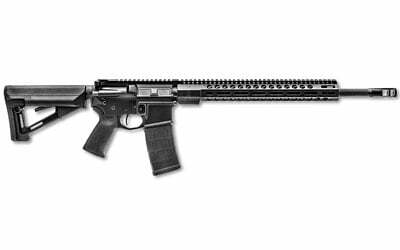 Proprietary 15-inch rail system with M-LOK technology. Magpul MOE grip and Magpul STR buttstock. H-type buffer assembly and tube. Ergonomic safety lever and magazine release. Forward assist. Magpul PMAG 30 round magazine.